Hey guys, im having trouble getting a 4 point harness into the driver side of my 05 ralliart, can you guys give me any advice on what is the best and easiest way to go about it, cause the center console is in the way of the right rear bolt for the seat bracket. You don't 4 points are not considered safe, check the schroth website.. I think It's called submarining.. You slide under the belt.. I'd go stock, or a serious 6 point or skip it.. I've seen plenty of track rolls with OEM belts and they do fine.. I saw a Mazda 3 roll about two weeks ago at the track. OEM belt did it's job. Yeah as much as I would rec getting some serious safety gear if you wanna hit the track, most modern cars(sedans) are designed to take a roll quite well.. They usually crimp up a bit,but maintain the shell and shape pretty well even after 3/4 rolls.. And I've been told poorly installed safety gear is worse than most OEM setups.. But each case is individual, and no one can promise anything, oneofmy EVO buddy's just drove off the hill at button willow last weekend.. Luckily he just drove straight off..
4-Point Harness = Your legs coming out of the top of your head while your face is getting smashed into the OBDII port under the dash then you getting ejected from the car killing you instantly, if you're lucky. "I'm making this post in an attempt to save the OP or anyone else who wishes to install a harness from ending up paralyzed or dead. You NEVER mount harnesses to the floor, period. What is keeping you from doing a face plant on the steering wheel/dash in a front end collision? The seatback? That seat would snap like a toothpick. Not only that, but as you fly forward into the dash, and you will, even in a low speed accident, I'm talking less than 10mph, the harness is going to pull down on your shoulders and compress your spine. If I saw a harness installed incorrectly in person I would take a knife or scissors and cut them so that they couldn't harm anyone. Furthermore, harnesses, harness bars, and roll cages have no place in a street car, period. The passenger was submarined out of his 4 point harness and ejected through the windshield, the driver hit the steering wheel and dash like he wasn't even belted in because the harness bar folded like a paperclip. This was a low speed accident, I believe they said that they rear ended someone at about 35mph. 99% of people have no idea how dangerous and deadly it is to use anything but your factory 3 point safety belts and factory seats on the street, this picture is evidence of why it is so dangerous. Use your factory safety equipment AND ONLY YOUR FACTORY SAFETY EQUIPMENT. DO NOT USE HARNESS BARS for safety equipment. Use a bolted or welded in roll cage. But, you are putting your life on the line if you use a roll cage or even a harness bar without wearing a helmet AT ALL TIMES in the car. I know of someone who was killed in a 25mph collision when he hit his head on the harness bar. DO NOT USE 4 POINT HARNESSES. Use 5 or 6 point harnesses. The reason you submarine out of a 4 point harness is that your upper body does not lean forward and over the lap belt like it would with a 3 point. Thus, the g forces force your body out under the lap belt. The act of submarining out of a belt is going to seriously injure and potentially kill you, but once you've submarined out of the harness, you are probably going to be ejected from the car. Also, if you have a 5 or 6 point harness and it works as it should, it decelerates your torso instantly in a frontal impact, but your head will continue moving forward. This will result in a debilitating or fatal neck injury or instantly fatal basular skull fracture. Oh and that front airbag, forget about it because you'll never reach it if the harness works. 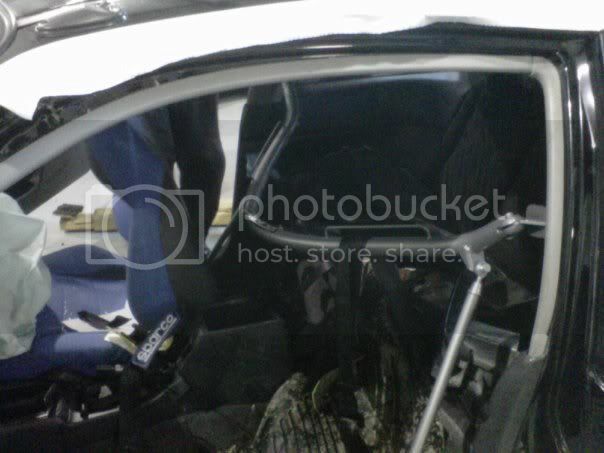 Next, harnesses should only be mounted at shoulder level and mounted only to a welded or bolted in roll cage, period. Mounting to the floor, or rear seatbelt mounts, causes the harness to pull down on your shoulders and crush your spine when you are in a frontal impact, causing a debilitating or fatal back injury. Also, you will be hitting the steering wheel/dash with full force if you've bolted the harness to the floor or the rear seatbelt mounts. STREET CARS DO NOT USE AFTERMARTKET SEATS. Well, they don't when they have integral airbags in the seats. When you remove the seats with airbags, the airbag light comes on, and you have now DISABLED EVERY AIRBAG IN THE CAR. You have no more front, side, or curtain airbags. You have also put yourself in hot water with your insurance company by removing your factory safety equipment. If you or someone else is injured or killed in your vehicle, even if the accident is the other guy's fault, you are the one who is going to get sued, not the guy who hit you. Also consider that accidents in race cars are NOT usually as severe as accidents on the street. Everyone is going the same direction on a race track, so no head on collosions. The track is lined with tire walls and barriers so that you cannot hit a tree. The track is set up so that collisions are deflected and cars can't deccelerate all at once. There is no spot on a track where you can go head on into something and deccelerate intantly. On the street, the hazards and potential impacts are far greater in likelihood and severity than on a track. Furthermore, the safety equipment used in race cars is a system, period. You cannot pick and choose what equipment you want to use. Don't use a harness without a HANS device, you can't use the HANS device without a helmet, and don't use a cage without a helmet, the list keeps going. YOU NEED EVERYTHING. Race car drivers do not piecemeal their safety equipment together. The factory safety equipment is the best possible design for street use and is also a system. When you remove or change one piece, nothing else works like it should. It kills me to see people risking and losing their lives so that they can have some Race Inspired Cosmetic Enhancements on their cars. If self preservation is at all alive within you, use your factory safety equipment AND ONLY YOUR FACTORY SAFETY EQUIPMENT. This is not an attempt to flame anyone, rather it is an attempt to help them from a life in a wheelchair, as a vegetable, or no life at all." Last edited by KyleKitchen; 07-11-2012 at 12:01 AM. Right on my friend track cars should only be used on the track along with the safty gear. my car now runs, an autopower 4 point roll bar, cobra seats with a proper sub strap hole, and schroth 6 point belts, ive had a few peeps laugh at my over kill style setup.. but i can honestly say: i have no fear about rolling my car..
if anyone wants to learn track and safety? try track HQ, im on there occasionally with lots of exp drivers... its a good place to learn..